The days of writing on a chalk board, distributing paper handouts, and using an overhead projector to discuss in-class worksheets may soon be behind us. Technology is moving ahead at a rapid pace and this has affected many aspects of a teacher’s life. Teachers in schools throughout the world must now be familiar with SMART Boards, cloud file sharing such as Dropbox, and even social media to connect students with teachers in ways previously never imagined. Today, classrooms are ditching out-of-date overhead projectors for more cost efficient and interactive tools, particularly SMART Boards. 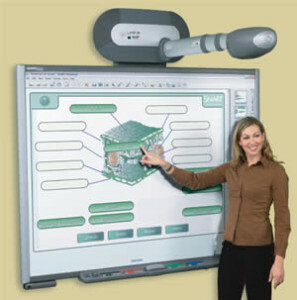 Manufactured by Smart Technologies, the SMART Board is an interactive white board with a projector, screen, and computer all bundled up together. Once connected, the SMART Board allows teachers and students to write with styluses, share webpages, and even play videos. The Nellie Mae Foundation provides an invaluable resource for teachers looking to integrate technology in the classroom, including lesson plans and suggested educational games. Further, you may want to consider an app store where teachers can look up games to download for students to play which can help make math and memorization fun. Check out this video to see a demonstration of how a SMART Board might work in the classroom. Another type of teaching technology that teachers should be familiar with is file sharing and cloud storage applications such as Dropbox and Google Drive. As many educators have discovered, USB storage devices can easily break and become corrupted. With Dropbox and Google Drive, simply upload any file from your home computer or laptop and reopen it back at school. In order for the transfer to be successful, the school computer must also have the software installed, but don’t worry, both applications are free! These file sharing applications are particularly helpful for collaborating on projects with colleagues, and can be a great way for you to assign, collect, and comment on your students’ papers. No matter which program you use, file sharing and cloud storage help to save paper, minimize printing costs, and are vital organizational tools for teachers. Finally, if you hope to market yourself as a technologically proficient teacher, you should be familiar with the various types of social media. Twitter and Facebook have millions of users making billions of posts, and it is to your advantage to understand how you might tweet, post, or even blog in the classroom. Social media allows you to connect with other teachers, organizations, and even your students. This can very beneficial for those teachers who are on long term leave, out of town, or those students participating in distance learning. Being familiar with social media will not only help you relate to your students, but it can also enrich the way you teach and manage a classroom. Read more about how teachers are using social media to enhance discussion and encourage student participation. While it may feel overwhelming at first, there has never been a better time to be a teacher. The access to unlimited information and new techniques will allow you to continuously develop your skills and improve upon your ideas. Being familiar with teaching technology and implementing it within your classroom can give your students a variety of ways to learn and help them achieve success.